If you want the fastest smartphone Web browser, get an Android phone instead of an iPhone. But if you want the fastest Web browser on a smartphone, definitely get an iPhone instead of an Android phone. These contradictory statements are the result of two smartphone browser speed tests, released within a month of each other. The latest comes from Blaze Software, which claims that Samsung's Nexus S smartphone with Android 2.3 loaded non-mobile optimized Web pages more than a second faster on average than an iPhone 4 running iOS 4.3. 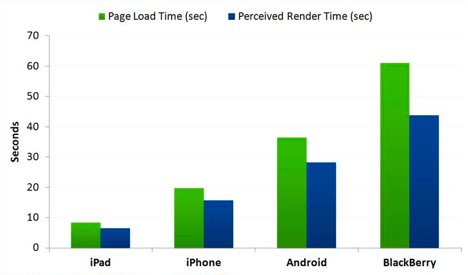 The speed difference for mobile Websites was negligible. An earlier study from Compuware Gomez, however, says the iPhone loads pages nearly 17 seconds faster on average than Android. Who are these companies that came up with drastically different test results? They're both in the business of optimizing Websites, selling their services to companies who want their pages to load faster. In other words, they both do a lot of Website speed testing, and neither of them are affiliated with Apple or Google. As for methodology, Blaze gathered data from 45,000 downloads from Fortune 1000 Websites over 3G and Wi-Fi connections, loading each page three times, according to Wired. Gomez used data from its own business customers, analyzing 282 million Web pages served across 200 popular Websites. In other words, both companies used real-world testing instead of benchmarks or closed networks. And yet, their results are completely different. Perhaps the big takeaway here is one that we've known for some time: browser speed tests can be pretty unreliable. With real-world testing, there too many variables, such as network congestion and server problems. Closed networks and benchmarks, on the other hand, aren't really representative of what real users will experience. In any case, if you're complaining that your super-futuristic smartphone renders pages a second or two slower than the competition, you may want to step back, take a walk and rethink your priorities.